Though he was academically brilliant, his passion was fully focused on the military, so at age 14, he joined the forces of the Prince of Orange at the siege of Rhynberg. Two years later, the Prince included Rupert as a member of his lifeguard during the invasion of Brabant. In 1636, Rupert and his elder brother Charles Louis (now Elector Palatine) journeyed to the court of King Charles in England. The King was impressed by young Rupert and awarded him with an honorary MA at Oxford. He returned to Holland and continued in military service, first serving the Prince of Orange and then joining Charles Louis on a campaign to regain the electorate. The campaign ended poorly, however, and Rupert was captured by the forces of Austrian General Melchior von Hatzfeldt at the Battle of Vlotho. He was held prisoner at Linz for three years, where he whiled away the time studying military textbooks, learning the art of engraving, and carrying on an affair with the daughter of the governor of Linz. Eventually, King Charles was able to arrange for Rupert’s release and in August 1642, Rupert and his younger brother Maurice arrived in England. Civil war has just broken out in England, and this provided Rupert with a perfect opportunity to advance his military ambitions. King Charles bestowed the Order of the Garter on Rupert and placed him in command of the King’s Cavalry. He fought his first major battle at Edgehill in October of 1642. He was absolutely fearless and his cavalry charge routed the parliamentarians. Unfortunately, his impetuosity carried him away once more and rather than staying at the battlefield to help ensure a decisive victory, he took off after the routed enemy cavalry, chasing them too far. His dashing fearlessness served him well for the most part though, and he quickly earned an almost legendary reputation amongst the Roundheads. Some even credited him (and his dog Boye) with supernatural powers. Though he had earned a formidable reputation through military success, his relations with his fellow commanders were tense. Most found him unbearably arrogant and impetuous, while he thought them overly cautious and direly unprofessional. He continued to lead superbly up until his outstanding relief of the Siege of York in 1644. Just months later, however, his forces were defeated by a parliamentary army at Marston Moor. The Royalists rapidly lost York, and then the north of England. After the Royalists were once again defeated at the Battle of Naseby in 1645, Rupert advised Charles to seek a treaty with Parliament; however, the king would hear nothing of it. When Rupert surrendered Bristol to the Parliamentary forces, Charles stripped him of his commission and Rupert went into exile in Holland. Rupert held a number of military posts throughout Europe and spent a decade in the West Indies and Germany. When the monarchy was restored in 1660, Rupert returned and was given a series of commands in the British naval forces. He was appointed admiral of the English fleet in 1673, but retired following a number of English losses. 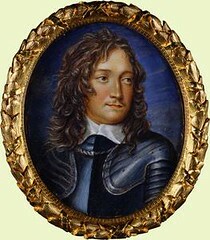 After a serious attack of pleurisy, Prince Rupert died on November 29, 1682 at his house at Spring Gardens. He was buried at Westminster Abbey after a full state funeral. Prince Rupert: The Last Cavalier, by Charles Spencer.